It's a bright, colourful puzzle game, it doesn't have to make sense! Puzzle games tend to sway towards abstract goals and objectives – “match these colors” or “move these blocks” and so on. With no explanation beyond “because we say so,” it can be difficult to grasp a player’s attention enough to make playing a generic puzzle game feel like it has a point. The question “why am I playing this?” came into my head repeatedly while playing Hacotama, beyond the obvious answer that I was reviewing it. The presentation in Hacotama is some of the best I’ve seen in an XBLIG game. The 3D environments and shiny textured elements are very nicely polished, and do not look like your typical bedroom-programmed indie game. Furthermore, the use of your Xbox avatar as a player character is always a nice touch — usually avatars are used in one-note, gimmicky games, but here it is used in a full, real puzzle game, and it adds to the professional gleam of the overall experience. Graphically, the game rivals many Xbox Live Arcade releases. Like many puzzle games, your character is asked to guide objects (in this case, balls) to their goals (shiny star things). 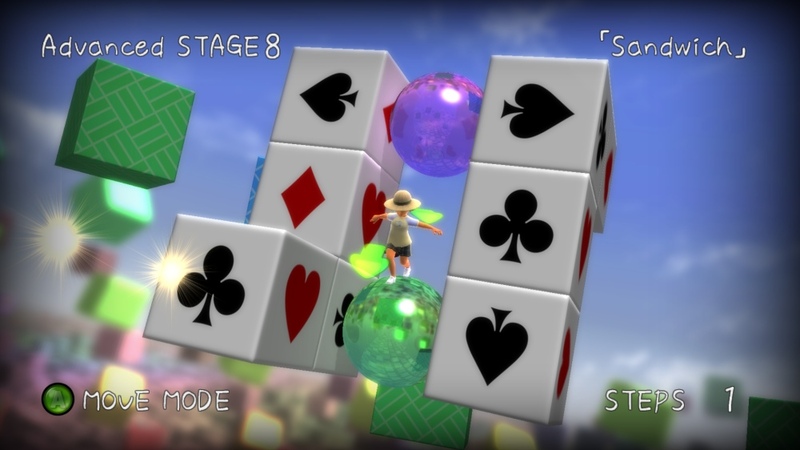 The twist comes from being able to move them in full 3D space, pushing them around the sides of levels, riding atop them along platforms, and even stacking them on one another, if the puzzle demands it. It’s a bit difficult to describe this process of exploring the levels from any angle, but it’s very simple to maneuver once you get into it. Unlike some puzzle games I’ve reviewed on the XBLIG market, Hacotama has an appropriate difficulty curve for simpletons like me. After breezing through the tutorial and beginner levels, I found some head scratchers that took a moment’s thought before I attempted them. In many cases the solution seemed obvious, but I could not reach my balls from the right angle (Editor’s note: that’s what she said). This subtle complexity adds depth to some puzzles, and rarely gets overly frustrating. The biggest problem comes from the lack of variety within these puzzles. Off the top of my head, I cannot think of a particularly memorable puzzle, instead only remembering a wash of balls and cubes in space. Levels are solid enough, with the right amount of challenge, but their layouts are never extremely interesting, for me at least. The controls are a little slow and stodgy for my liking, giving everything a weight that brings down the pacing. Pushing balls around is a tedious process (Editor’s note: again, that’s what she said), especially once you have figured out a final path. Once the end of a level was in sight, I felt like I still had a long process of actually executing my plan. A handy undo button helps avoid the chore of moving things back to their original place, but it doesn’t alleviate how slow the rest of the level can be. Additionally, the camera has a bad habit of occasionally getting in the way of the action, but never enough to confuse gameplay completely. A mostly positive experience then, bogged down by some forgivable slowness. This brings me back to my question: why was I playing this? With no story to progress, and no hint of exciting rewards to come, what is the point of repeating the same task over and over? Is this some metaphor for the futility of life? I don’t have an answer. I wouldn’t say that Hacotama is particularly exciting or satisfying, just extremely functional. The puzzles, while often challenging, never feel overly clever or unique, and were often bested by some simple trial and error. I never found myself looking forward to the next one. While the overall mechanic of manipulation in 3D space is fairly fresh, the levels were never imaginative enough to excite me. Perhaps puzzle game aficionados will find some joy from the 40 levels offered here, but it didn’t hold my interest strongly enough, especially in comparison to other games on the market. Hacotama is not bad, but it is probably a case of style over substance. Excellent presentation does not hide the fact that this is a pretty standard puzzle game, with little to stand out from the crowd. If you just can’t get enough puzzle games, give this a shot, but otherwise this is unlikely to pique gamers’ interests.